The majority of respondents to the survey worked for e-commerce companies or development and design agencies working with e-commerce clients. Many of the respondents were from startup companies, with between one and three employees. The remainder of responses was well spread across companies of different sizes, right up to two-hundred-plus employees. The majority of respondents were based in Ireland. Most responses to the study were supplied by founders and senior management (CEO, E-commerce manager, Head of Technology). 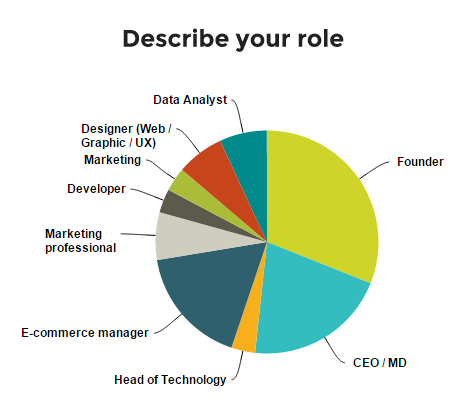 The rest of the responses came from workers in marketing, analyst, development and design roles. 27% of respondents said that they don’t use any analytics solutions to measure website performance. We found it very surprising that over 27% of respondents said that they don’t use any analytics solutions (such as Google Analytics) on their website to measure performance. For those who did use analytics on their (or their clients’) website, the vast majority (87.5%) used Google Analytics. 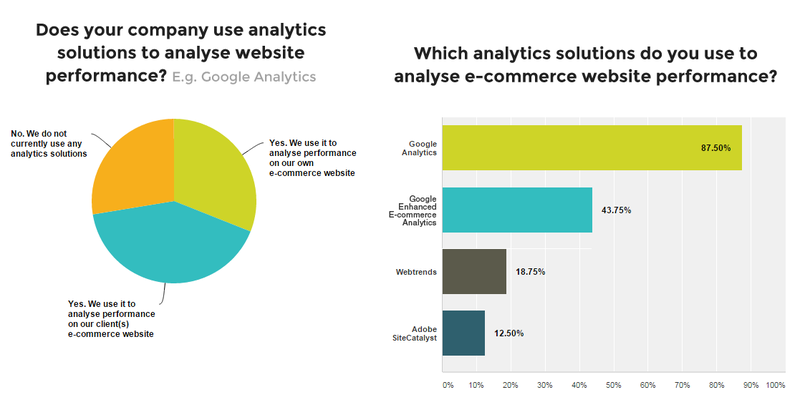 43.75% said they were using Google’s e-commerce specific analytics solution (Enhanced e-commerce). The next most frequently used solutions were Webtrends and Adobe SiteCatalyst. There was a fairly large number of other solutions which were named but are not published here due to space concerns. Respondents said that the findings gained through website analytics are mostly used by senior management and by marketing teams. 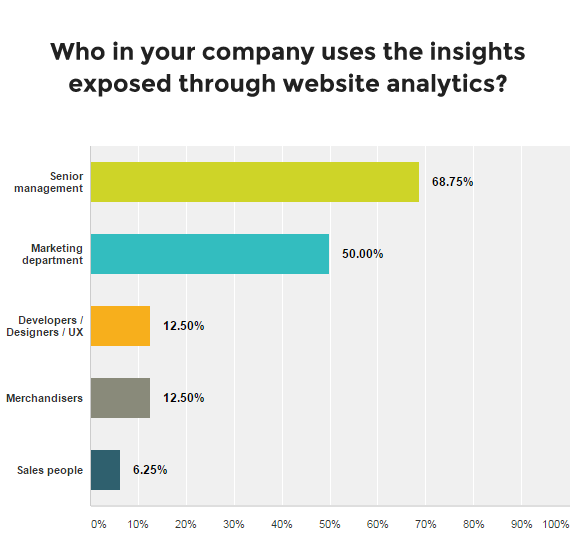 Insights from analytics are also used by developers, designers, user experience, merchandisers and sales people. 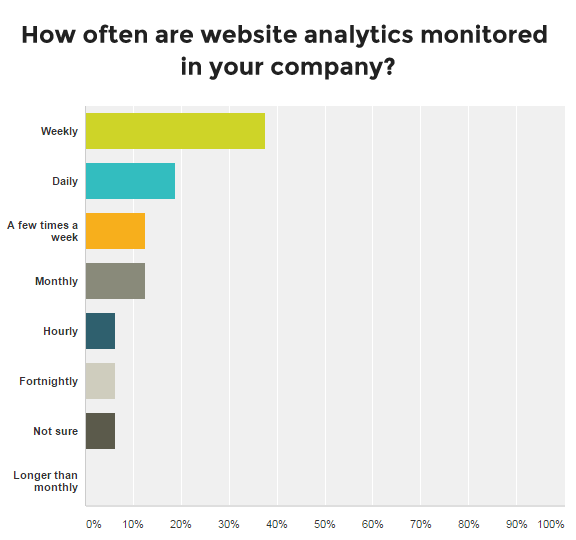 Most companies monitor their website analytics on a weekly basis. A few respondents said that their company’s website analytics is monitored hourly, while none said analysis took place less frequently that once a month. 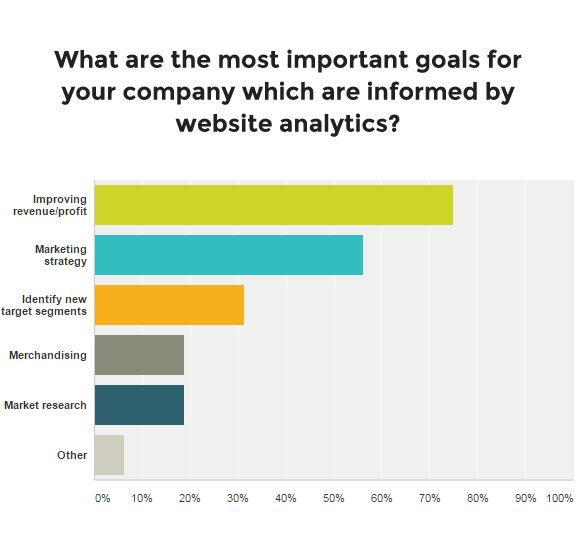 Clearly, most respondents recognise the importance of analytics in helping to achieve the company’s business goals. 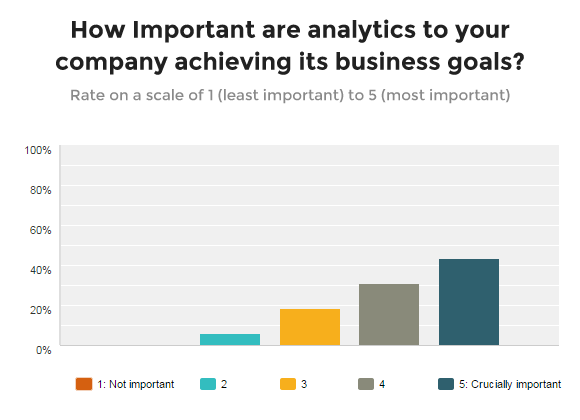 75% of respondents rated analytics as a four or five (out of five) in terms of importance to the company reaching its business goals. Predictably, the single most important goal which analytics help to achieve is increasing revenue and profit for the company. The next most important goal is helping to inform marketing strategy, followed by identifying new segments of customers to target, based on demographic or behavioural data. None of the respondents to our survey said that they were very satisfied with their current analytics solutions. We defined ‘very satisfied’ as ‘I can access all key statistics that I require’. Most people (75%) said they were just satisfied, which was defined as ‘I can access most of the key statistics that I require, but I feel there are some which aren’t covered or are difficult to access’. The majority of respondents rated their current analytics solutions a three or four (out of five) for effectiveness in achieving business goals. We asked respondents “What are the worst aspects of your current analytics solutions?“. By far the most frequent answer was that it can be difficult to identify what is really important within the large amounts of data presented, especially for smaller companies who do not employ someone with expertise with analytics solutions. We asked respondents to grade a number of analytics features by how useful they thought each was. One of the features was ‘suggested actions to take’ based on the data presented for their website, and 80% of respondents rated its importance as four or five (out of five).